I’ve been doing this for quite a while (over 10,000 hours). 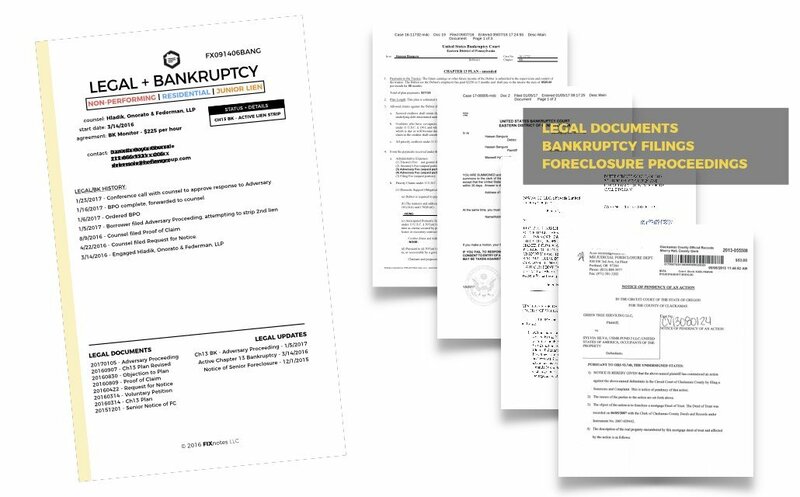 I’ve bought & sold THOUSANDS of assets, analyzed over $1 BILLION of nationwide real estate and have established myself as an AUTHORITY on pricing distressed debt since my 2014 report was published in the Paper Source Journal. I’ve spent years building a major distressed debt investment firm from the ground up. Among other critical business components, I’ve been responsible for developing an air-tight acquisitions process, facilitating loan boarding & vendor management all while generating profitable dispositions at scale from an active portfolio of hundreds of mortgage assets. With one of my clients, I’m responsible for bringing over 2,500 loans from acquisition to disposition and have played a major role in the monetization of 4,600 assets, collecting almost $22 MILLION of revenue. I have a DEEP UNDERSTANDING of the full loan life-cycle and know that even a small oversight in DD can create DISASTROUS ripple effects down the road. Even when you have it right, airtight research & analysis won’t protect you from faulty collateral. A perfect note on paper without original, enforceable documents might be worth nothing. Everyday, files are traded around the secondary market without proper endorsements, servicing records or RESPA procedure. Whether you’d like to review your own portfolio or analyze notes for sale, FIXnotes research, analytics & data design will take your investments to the next level. Our flagship offering [in development] combines a suite of resources into FOUR CORE REPORTS to comprehensively review & refine your asset into actionable, decisive intelligence. 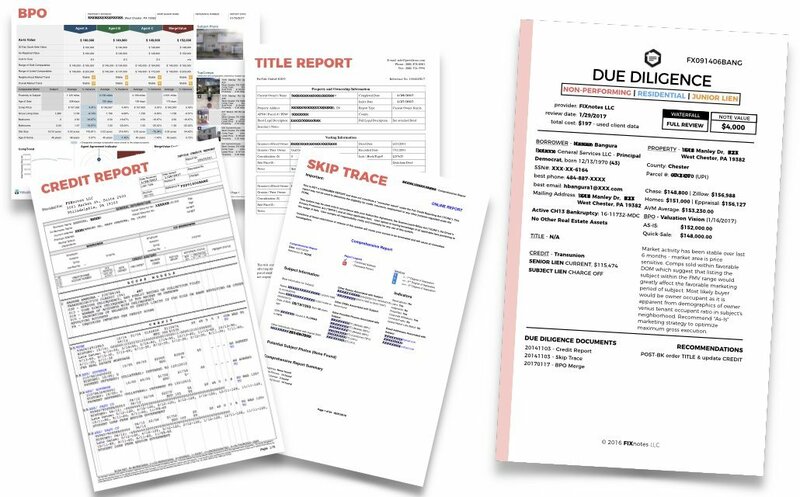 Each one-page, legal sized (11″x14″) report serves as a summary divider for your original collateral, vendor research, servicing files & legal documents. Every FIXnote begins with ASSET VITALS. 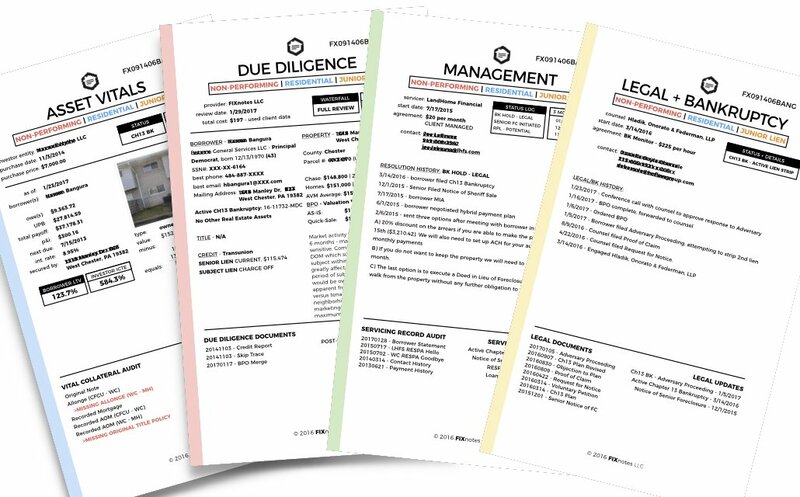 Starting with our signature legal sized summary page outlining your investment, this is where you’ll find your expected yield, equity & critical status flags followed by verification of enforceable, original documentation. Our DUE DILIGENCE is second to none. 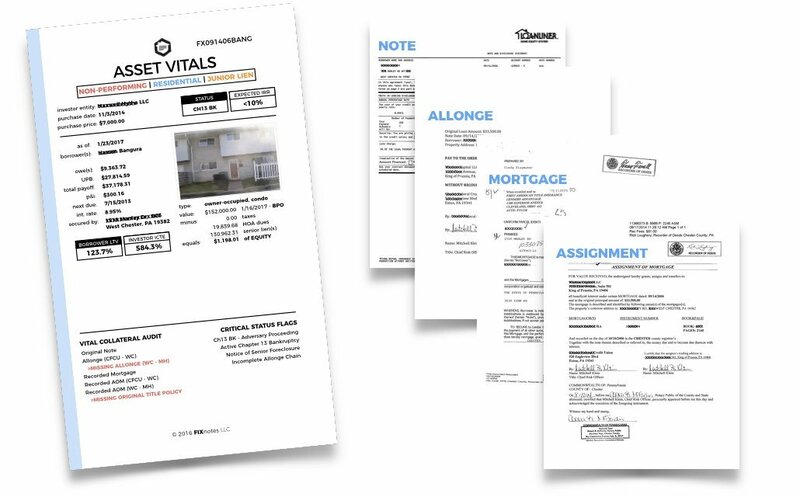 Enclosed you’ll find updated title, property value, tax, credit & skip trace. Aggregated data is calculated into an estimated market value for your asset. Asset MANAGEMENT on one beautiful 11″ x 14″. 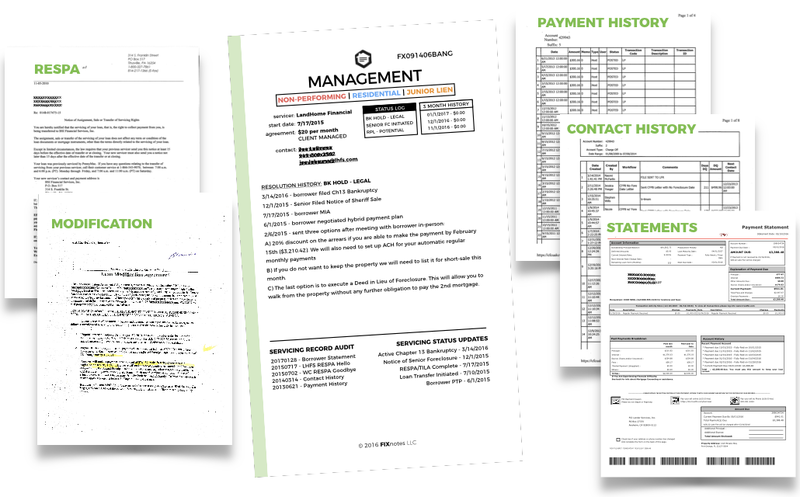 Included within this section are your borrower’s payment, contact history, resolution agreement, proof of insurance, authorizations & most recent statements. We’ll communicate with your servicer to get all the details, then share our findings with you. Stay ahead with LEGAL + BANKRUPTCY. Every FIXnote includes an organized review of all your critical legal situations. After you connect us directly with your legal counsel, we’ll talk shop and summarize the situation in the simplest terms, preparing you for action. WE’RE ACCEPTING 20 MORE ASSETS TO UNDERGO THE FIXnotes TRANSFORMATION AT A 50% DISCOUNT. Don’t worry, you’re definitely going to have questions, and that’s OK! Included with every FIXnote is a full hour of phone consultation time. What do you need from me to create my FIXnote? What if I don't have any data? At the bare minimum, we’ll need the loan data tape (an Excel file with the relevant loan details). Without updated vendor reports, the resulting FOUR CORE REPORTS won’t be as effective. If you don’t have BPO, Title, Credit or Skip Trace (updated within the last ~6 months), we strongly encourage you to add updated data options at checkout. What if I don't own the loan already? If you have permission from the asset owner to communicate with the loan servicer & legal counsel and written authorization to pull credit & run a skip trace, we’re all set! If you’re missing any of these authorizations we can still proceed but your data will likely be incomplete (unless the seller has provided servicing records & updated vendor data). When will I receive my completed order? As FIXnotes is still in BETA, new orders aren’t expected to be completed for up to 2 weeks. To be notified when we’re running at full capacity, JOIN THE MOVEMENT on our home page. Once an order is complete, you’ll first receive a PDF delivery by email. You’ll have 48 hours to review & make any changes before the documents are printed and shipped! Unfortunately we are not able to offer a 50% discount on vendor data upgrades. You will be able to add vendor data upgrades on the next page after clicking CHOOSE YOUR OPTIONS in the pricing section below. Rob is hard at work on the FIXnotes TRADE DESK. For the comprehensive review, we’ll need updated data. If you don’t have recent vendor reports already, we’ll order them for you! 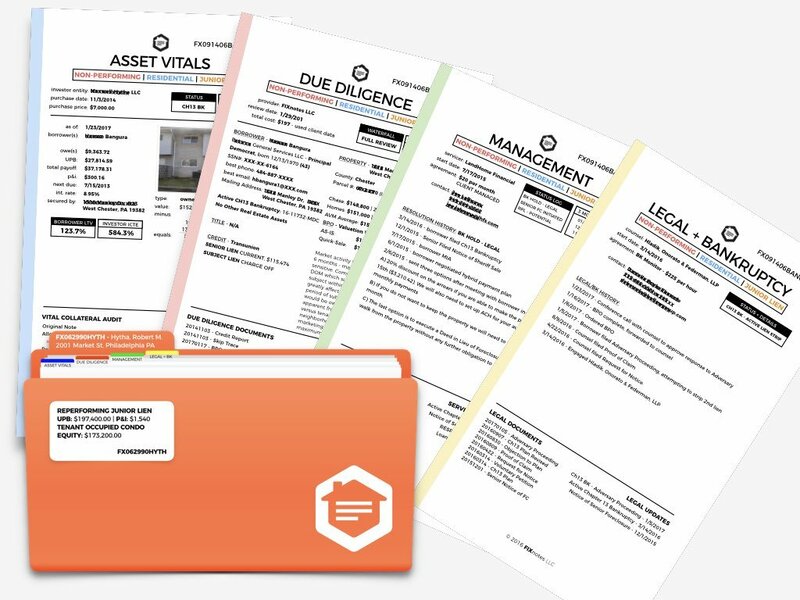 FIXnotes transforms your data & collateral documentation into the “OWNER’S GUIDE” for your investment by fusing VENDOR INTELLIGENCE, SERVICING RECORDS and COMPREHENSIVE RESEARCH. Say GOODBYE to ugly BANK FILES and HELLO to beautiful DATA DESIGN. We’re only accepting 20 BETA TEST orders.